Life can’t half be complicated sometimes. Tax returns. Starting gym memberships. Cancelling gym memberships. Ikea flatpacks. Roadworks. Traffic jams. Car insurance. Urgh. And that’s why riding a bicycle is so special. Riding a bike requires no forms. There’s no license. No real ongoing cost. Just you, a bike and a destination of your choice. For many people, learning how to ride a bike is a defining memory of childhood. But for others, this moment never happens, and they reach adulthood without learning this skill. So, in this post, I’ll provide a guide and some useful videos and resources on how to teach a child to ride a bike, as well as some information to help adults learn how to ride a bike. Then we’ll even cover our hairy friends, looking at the best ways to travel with a dog on a bicycle – and even look at a dog riding a bike (yes, you read that right). But first, let’s start with humans on two wheels. Learning how to ride a bicycle is a right of passage for many – and it’s remarkably simple, even if it can look terrifying for those who have never done so. Physics of a Bicycle: How Does a Bicycle Work? 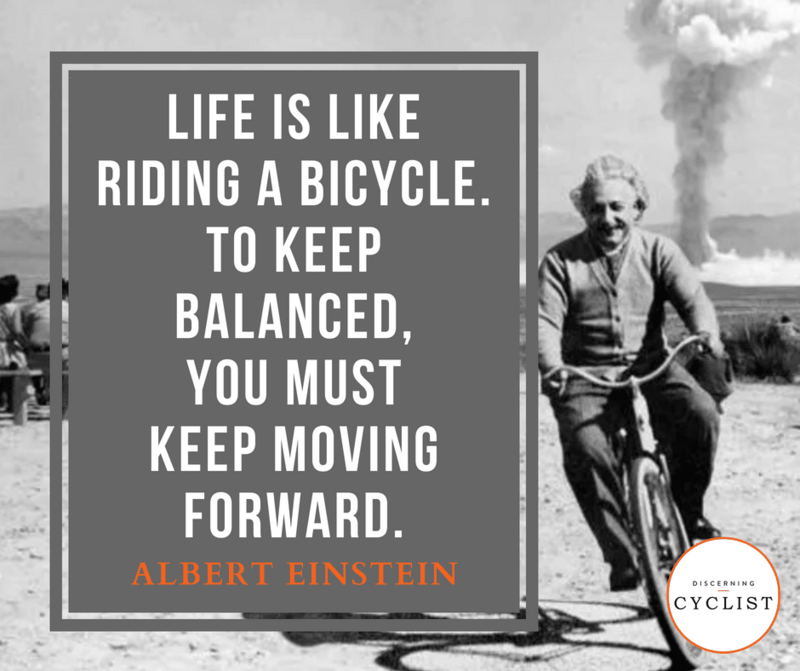 And here in lies the most important advice for anyone looking to ride a bike – keep moving, keep peddling! Okay, with some fun bicycle physics and cycling quotes out of the way, let’s get on to some more practical stuff. In the following sections, I’ll provide some (hopefully) useful resources about learning to ride a bike. We’ll start of with some advice about how to teach a child to ride a bike (so some tips for parents and guardians), before moving on to tips for adult learners. So, let’s start with a frequently asked question: at what age should a child start learning to ride a bike? Well, many publications suggest between around 4 and 5 years of age is a good time to start learning to ride a bike without stabilisers, as children should have sufficient motor skills and balance to ride a bike by this age. But this isn’t really the right question. The more important aspect is HOW to teach a child to ride a bike – and, in particular, what type of bike a child should learn on. Many people, myself included, learn to ride using bicycle stabilisers. However, this is not an optimal way of learning, as while they can help a child get to grips with a bike in terms of peddling and steering, stabilisers don’t help children to learn how to balance on a bike – indeed, stabilisers can even encourage bad habits when learning. 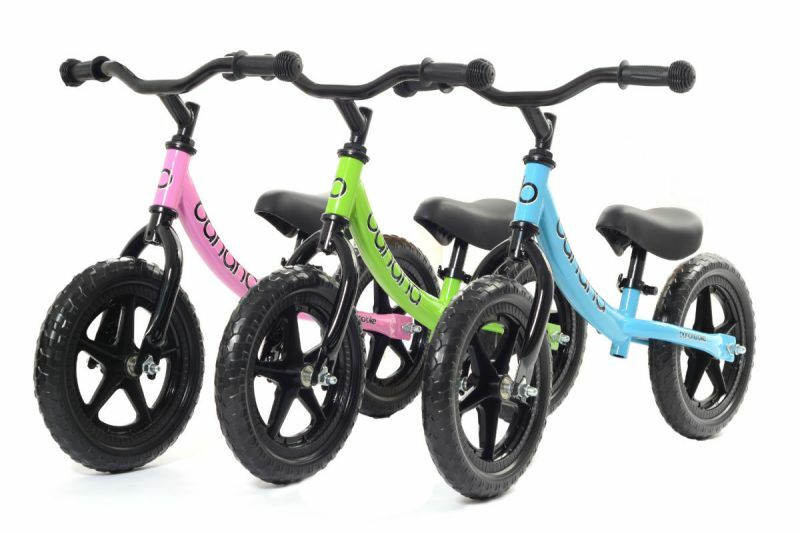 Therefore, more and more children are getting their first riding using balance bikes, which – as the name suggests – are the best way to learn how to balance on a bicycle. One of the most important tips on teaching a child to ride a bike – especially if your kids are still toddlers – is to get them straight on a balance bike. Indeed, you can even get the little ones riding about as soon as they are comfortable on their feet (around 18 month old) – which is significantly earlier than learning on a bike with stabilisers. Balance bikes have only during the past few years become the preferred way to teach children to ride a bicycle in the UK and USA, but they’ve long played a key role in education in cycling meccas like Germany, the Netherlands and Denmark. A balance bike is effectively “running bike”, in that it has two wheels and a seat, but no pedals. This means children use their feet to generate speed and thus allow them to go at a pace they feel comfortable – without committing to a minimum speed like on a normal bicycle – this is key for growing their skill set and confidence on the bike. This initial phase tends to be the longest and will see your child walk with the bike between their legs and occasionally sitting. One of the most important tips on teaching a child to ride a bike to let your child take the lead (especially during this phase) and allow them to get comfortable with the bike, while giving them plenty of opportunities to use the bike. Once the child becomes more comfortable with the balance bike, they normally start sitting down while walking with the bike. This is an important phase as it is when children begin to grasp the point of the bike. If possible, try and surround yourself with other young bike riders/learners during this phase so that they can see the fun that can be had on a bike. Sitting, running and balancing tends to be the shortest phase, as once a child reaches this stage, they quickly move on to gliding. Finding big open areas that are safe will help your child explore and rapidly grow in confidence on the bike at this point – although get ready for a lot of running on your own part! 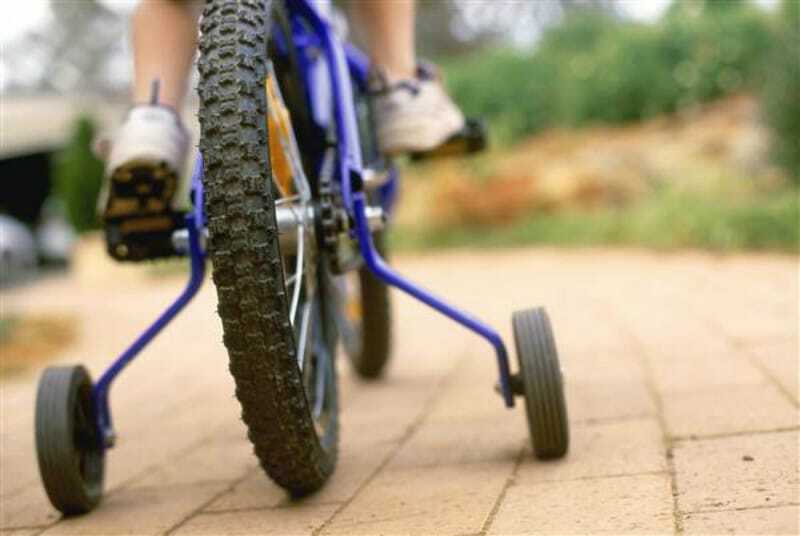 The final step will see your child achieve mastery of the balance bike and will happily generate speed and then glide and steer simultaneously. This is perfect, as your child now has the necessary skill set to ride a bicycle without stabilisers – they just need to adjust to pedalling. One of the biggest frustrations with buying bikes for children is that while your kids grow, their bikes don’t – meaning you may well need to shed out for a new bike every few years. Fortunately, balance bikes are very cheap (starting at around £25) and there’s no need to blow your beans looking for the best balance bike. 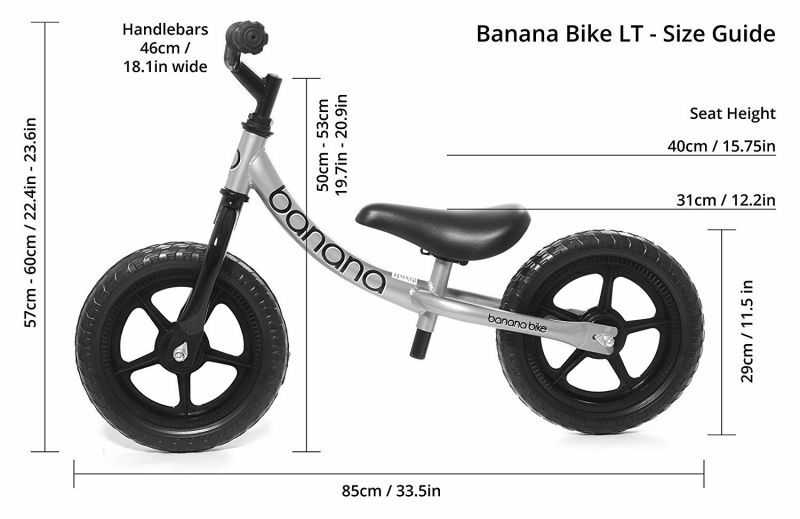 One of the most popular and highly-rated balance bikes for kids aged between two and four is the Banana Bike LT, an extremely lightweight bike available in blue, pink and green for £38.99 from Amazon. Once a child has mastered a balance bike – especially if they are beginning to outgrow it – they’re probably ready to switch to a pedal bike. Now, a children’s transition from a balance bike to a pedal bike can take as little as 15 minutes, while for other children it can take a few weeks. The easiest way to help a child get used to the change is by letting them, at first, use the push bike like a pedal bike as they get used to the different model. At this stage, teaching your child about the brakes and how to use them will be very effective. Then, when your child is getting more comfortable with the bike, encourage them to use the pedals. Alternatively, to give your child a quick introduction to pedals, you can leave the bike stabilisers on as they practice pedalling – but this stage needn’t take more than 15 minutes, as the child already has the balance and steering skills from riding a balance bike. Obviously, accidents can happen at this stage so be sure your child is wearing a helmet. It’s never too late to learn to ride a bike. A big problem for people that don’t learn to ride a bike as a child, is a combination of fear and a perceived social stigma of not being able to ride a bike as an adult stops them from even wanting to learn. 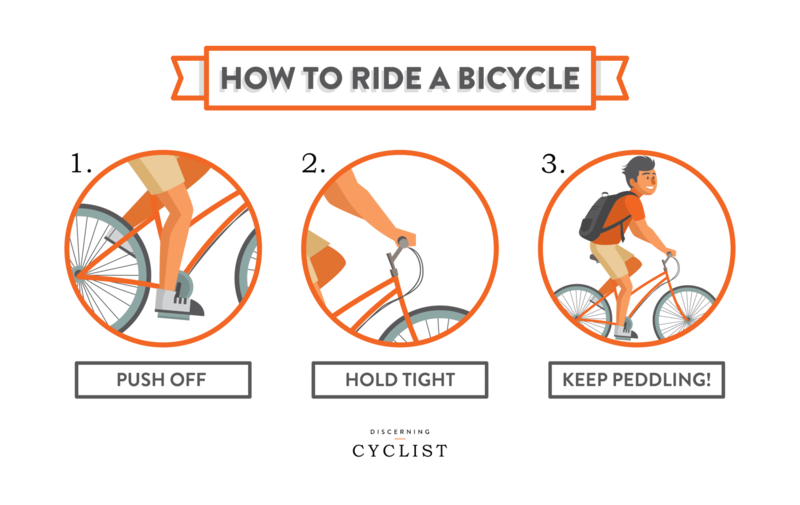 However, if you or a friend have reached adulthood without having learned to ride a bike, fear not: we’re here to help to get your peddling around safely. Just as is the case with kids, learning to balance and steer are the fundamentals to being able to ride a bike. So, while it’s hard to find a balance bike for adults, there’s no reason you can’t take off the pedals of a bike as you get used to balance and moving. Of course, you don’t have to do this, but it does prevent you kicking or shinning (ouch!) your pedals as you learn to balance. It may sound a bit daft but getting used to getting on and off your bike is the first step to mastering cycling. Simply lean the bike toward you (while holding the brakes) and put your favoured leg over. Practice this a few times until you are comfortable. Understanding braking is a key block in building confidence in new cyclists as it is very much a safety net if you feel like you are losing control. In order to do this, a good exercise is to walk down the street next to your bike and practice pressing the brakes as you get a feel for their effectiveness. Remember to apply even pressure to both the front and back brake. Once you’re used to getting on and off the bike and braking, you’re ready to get to grips with balancing on the bike. To do this, simply sit on the bike and use your feet to walk and push yourself about. Take your time and steadily build up confidence. As you get more comfortable, feel free to lift your feet up and glide along for as long as possible. If you can, put your feet on the pedals when doing so. Using your eyes is one of the most valuable ways of maintaining balance on a bicycle – or anything for that matter. When on a bicycle, look up at where you want to go instead of at obstacles you want to avoid – this will help you stay balanced and therefore follow your line of vision when riding. Once you’re comfortable braking, balancing and gliding, the next step is to build some speed using your feet, and then put your feet on the pedals and start pedalling. For learner cyclists, it’s worth setting the seat to a lower position so that your feet can easily reach the floor, but as you become more skilled, move the seat up so that only your tip-toes reach the floor with both feet. However, if you’re pooch isn’t quite so proficient on a bicycle, you can still bring them along for a ride in numerous ways, there are dog baskets for bikes, so they can sit on your bike, as well as bicycle dog trailers, in which your dog will be towed behind you when riding, or – if you have a more athletic dog – you can use a special dog bike leash so they can run alongside you! And there we have it: how to ride a bike for kids, adults and dogs! COMMENT BELOW: I’d love to hear your stories and tips with regards to your own bike stories, especially about teaching your child or an adult friend you’ve helped onto two wheels. Previous story Reflective, Waterproof, + Stylish – Is This The Best Commuter Cycling Jacket Ever?